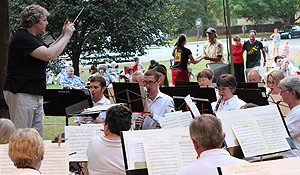 Eileen Young (left) conducts the Salem Band. 1. As music director of the Salem Band, one of the nation’s oldest community bands (est. 1771), Young combined students from her Wake Forest studio with band members, other Wake Forest music faculty, and the WFU Chamber Choir to rehearse and perform on the American Dream Concert, the culminating event of the “Voices of Our Time” symposium on Thursday, Oct. 11. The combined Salem Band ensemble performed selections relevent to the American Dream, including “Battle Hymn of the Republic” and “America” from West Side Story. 2. As conductor of the 18-piece Wake Forest Clarinet Choir, Young took the ensemble to Greensboro on Saturday, Oct. 13, to perform on the Vandoren Clarinet Ensemble Festival at UNC Greensboro. The WFU Clarinet Choir is a collaborative ensemble that includes music majors, minors, students and faculty from across campus (Law School, Divinity School, department of music). Participants also experienced master classes with Stanley Drucker (principal clarinetist with the New York Philharmonic for decades), Paquito d’Rivera (famous jazz clarinetist) and Alcides Rodrigues (bass clarinetist in the Atlanta Symphony). Additionally, Eileen’s student ensemble, the Wake Forest Premier Saxophone Quartet, performed by invitation of the department of music faculty on the Student Showcase Recital on Tuesday, Oct. 16, the only chamber group to perform on the recital.